One of those engagement tools that we'd been using for many years was a crowd-surfing ball - basically a sponsor-branded beach ball thrown into a crowd to bounce around above their heads. We've delivered these at countless events including the London 2012 Olympic Games. It's just a pleasing, fun, crowd-engagement device. 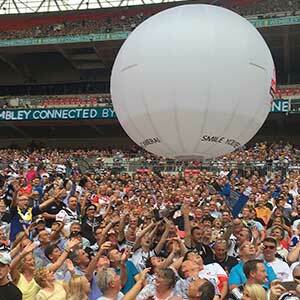 However, we were looking for ways to bring the crowd-surfing ball into the modern era, so we started knocking around ideas in the office and eventually thought, "Wouldn't it be fantastic if we could use the ball to record footage of fans underneath it as it's bouncing around above their heads?" The original idea was that we would just use any footage we captured as a pre-record, basically by fitting a micro-camera/GoPro or something similar to the ball. We initially tried this in a very simplistic way at the 2015 Marriott London 7s rugby tournament at Twickenham Stadium by attaching a GoPro underneath the ball. We threw it into a crowd for the first time and, to our disappointment, the footage was entirely unusable. What became apparent was that a camera attached to a wildly spinning ball makes for a pretty unstable, and unwatchable shot. Despite this minor setback, we still liked the idea, but our approach to getting content out of the ball needed to be adapted. We started giving some further thought about how we might create a more stable image. We spoke to our friends at The Dream Engine who we'd worked with for many years on various aerial stadium projects and they came up with an ingenious way of giving the sphere a much more stable flight. The result was the second generation EYE IN THE SKY, which indeed gave us a much more usable picture. The only remaining problem, and it's a fairly significant one for sports entertainment, was a lack of immediacy. In other words, although the footage we were capturing was much better, we still had to record it, get the ball back, extract the footage from the camera and do a bit of editing, and then upload it to YouTube or wherever. It was fun and we got some great material, but it was always after the fact, which diminishes its value for crowd engagement and entertainment. Undaunted, we started researching how to get a live picture out of the ball - and by this time we were working with America's National Football League (NFL) for their International Series games in London, where a sold-out Wembley Stadium would be a perfect opportunity to really get EYE IN THE SKY completely right. We were aware of GoPro's Vislink-driven HEROCast(TM) system, which we became increasingly convinced would be a good option for us. We approached GoPro who liked our idea so much that they lent us a HEROCast system as well as an engineer to help us put the whole thing together. We filled our ball with a mix of helium and air, which gave it a very nice, gentle, floaty motion rather than the abrupt, uncontrolled bouncing we had experienced before. The result was a great deal of live footage that was just fantastic. Everyone went mad for it, and we've never looked back. We ended up using it for all three NFL International Series games in London in 2015. One of the representatives of the Jacksonville Jaguars liked the EYE IN THE SKY so much that we were asked to take it to EverBank Field, the Jaguars' home stadium in Jacksonville. The NFL subsequently decided they wanted to use one for Super Bowl 50 at Levi's Stadium in San Francisco in February of 2016. The live images were transmitted to two giant screens in the stadium, each the size of 600 domestic television sets. We've now done EYE IN THE SKY projects at a number of football, rugby, and other major events and a number of broadcasters worldwide have expressed interest in taking some of the footage, most likely as a pre-record for cutting into highlights packages. Broadcasters always want to show the colour and atmosphere of a major sporting event, for which EYE IN THE SKY provides a compelling, and fun-filled, perspective. Although there are a number of micro camera transmitter/receiver systems that we could have used, having spoken to GoPro and Vislink at length about our idea - both of whom have been really supportive - it became clear that HEROCast would be our answer, and it was GoPro that put us in touch with Presteigne Broadcast Hire, one of the only major UK hire companies that had stock. Since that moment, it's been a smooth running and seamless process. Presteigne has a great understanding of what HEROCast is, how it works, and the way we needed to incorporate the RF transmission and receive aspects into our overall EYE IN THE SKY product. Presteigne engineers have now done a number of these jobs and we have always found that, as well as the kit being very good, they are really on board with us. They don't just come in, set the kit up, and leave or sit in a corner, they're actively involved in the operation of the Sphere. They bring the EYE IN THE SKY into the stadium and help us deploy it into the crowd, but before that it's tested thoroughly to ensure it's switched on, transmitting properly, and that we're getting a good signal. You may wonder how on earth we get a partly helium filled balloon back, and that's one of the subtle strokes of genius about our revised approach. There's just enough helium to keep it operating smoothly without floating out of the stadium. The natural camber of stadium seating means that gravity will always eventually bring the ball back to us, and as well as making sure the kit is completely operational, Presteigne engineers very much work as part of our overall experience delivery, and retrieval, crew. As a result, we've built great relationships with those engineers, which has led us to do a number of unusual jobs with them now. For example, we manage a season-long contract with the Saudi Pro Football League, who love the EYE IN THE SKY. Presteigne arrived with the complete bag of tricks, every spare you could imagine that might be required to enable us to deliver in a fairly harsh, dusty, hot environment. They now come in to see us to explore others areas where they might be able to help out. In fact, with Presteigne's help we're now incorporating the HEROCast in ways beyond the EYE IN THE SKY concept, basically as live RF cameras to stadium screens - almost as selfie shots to the big screen. We're now fully invested in incorporating these micro RF camera and transmitter systems and want to keep finding interesting new perspectives and angles to film all of our sport presentations, in many cases becoming an integral part of the show. That's 360 event coverage, if you like.